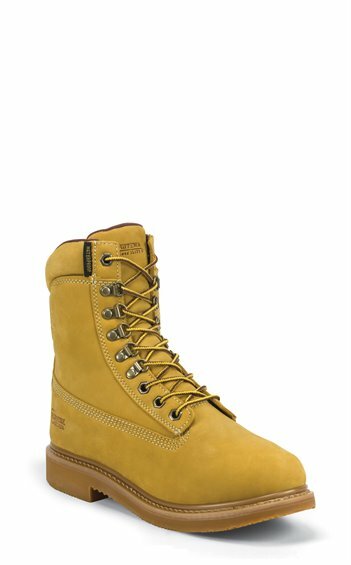 The Gunnison 8, 8-inch tall men's boot features a yellow gold leather exterior that’s waterproof with seam seal construction to help the keep feet dry and comfortable. The Bontex® insole offers lasting comfort and support throughout the day and its steel shank provides stability. With 400 grams of 3M Thinsulate™ Ultra, this interior layer is lightweight, breathable, and moisture-resistant. It's thick for even greater warmth and comfort, yet still thin enough to allow complete freedom of movement and designed for some of the harshest conditions and retains insulating value in damp environments. The Vibram® outsole guarantees traction on various surfaces so this boot is prepared for any adventure.